Public input was accepted from February 16 to April 8, 2016. We would like to thank everyone who submitted comments on the Regional Transportation Plan (RTP). A Discussion Paper will be released in Summer 2016 on the RTP review, providing an additional opportunity for feedback toward an updated RTP in 2017. For more information on the RTP review and update, please visit www.metrolinx.com/theplan. The Regional Transportation Plan for the Greater Toronto and Hamilton Area was adopted in 2008; a bold and visionary blueprint that outlined a common 25-year vision for all modes of transportation in the region. According to the Metrolinx Act, 2006, Metrolinx must complete a review of The Plan every 10 years from when the Act came into force. The review will be completed in 2016. The update to the Regional Transportation Plan will be released in 2017. The Plan was originally developed in consultation with municipalities, residents and many other partners across the region. Throughout the review and update, we will be seeking feedback from a wide variety of sources to ensure that the plan reflects the needs and priorities of the region. Look for our Discussion Paper, to be released in Summer 2016, where we will share our findings from the review, and seek feedback. And of course, you – the residents of the GTHA. Download the Regional Transportation Plan presentation in PDF form. Do you have any comments you'd like to offer? Currently I live in the castlemore region. I regularly commute to downtown Toronto for school and it takes 2 hours to get there and 2 hours back (4 hours a day for my commute). This is because their is no go station near my home . It is like you guys have completely forgot about this region. Funny how people who live on the west side of Brampton have a go station near them and only require 1 hour to get to downtown.The Kitchener line completely misses Brampton because it only has stations on the west side. ( I don't count the bramlea station as a "Brampton" station when is located at the border of Brampton and Mississauga). Mississauga has three lines that cover the whole Mississauga but Brampton only has one line that just covers the far west. There is not even a bus terminal near my home. Why not build a bus terminal at the gore and queen? Already 7 busses go through intersection (23, 501, 31,35, 50 and the 77 from yrt) if you guys were able to do that you would help the transit problem a lot. Plus you could further service that area by sending go buses to that terminal. I would love to come to the transit hearing on march 1 but I have school. please take in consideration the castlemore region. If SmartTrack replaces any of the GO lines with subway like service, the extra stops will just make the commute longer and less pleasant for all of the people who use the GO lines to travel longer distances, defeating the purpose of the GO train. Most of the existing customers on the GO train just want to commute directly between downtown Toronto and the surrounding cities as fast as possible. If the existing GO train corridors are used for SmartTrack, separate tracks should be added so that express trains can be used for all the people travelling longer distances. Most of your points don't apply to the Stouffville line. Many people intentionally bought homes near the GO stations in Stouffville, Markham, and Scarborough knowing that they have express train service into downtown Toronto. Now that's in danger of being taken away from them. While it would be great to allow more people in Toronto to benefit from the train line, it shouldn't be done at the expense of all the existing customers. Nothing comes for free. If the cost of adding an extra track for express trains is what it takes, then that's what should be done. There is no way that electrification alone will offset the delay from the potential number of new SmartTrack stations to be added. Good question about Stoufville, the EMUs would be about 10 years for faster accelerating to maintain service with infills. I imagine sections will be triple tracked with passing sections by then. SmartTrack only goes to Unionville. I suspect Stoufville trains will go express over the Smarttrack section, but I suppose multiple scenarios are possible (e.g. short-turning most SmartTrack trains at Unionville, and sending an occasional one to the end of the Stoufville line). In France, the Paris "RER" train service actually does something similar on RER B, sending their distant electric trains express to skip the inner allstop stations -- while other identical trainsets are doing allstops at the same time. They pull it off with just two tracks in many parts but passing tracks/station sidings/etc. I imagine signals will have to be upgraded to make this reliable. This scenario could perhaps happen, to allow you to have a faster schedule. But honestly I'd love to know the details too. I'm not worried about slower schedules (being the only option) but the exact details of Stoufville is indeed a good question. Stouffville doesn't have an "express" line when it currently takes about 1 hour and 10 minutes to get downtown . E.g. check out Lakeshore East from Oshawa in the AM (50 mins. vs. 1 hr 3 mins). This route is painfully slow and quite frankly, is becoming more economical for people to clog the highways for 2+ passengers. I would think by adding 3 or more routes (even with electrification), Metrolinx is losing touch why this route was opened to the Stoufville line commuters in the first place for 30+ years. Local tourists and tourists from abroad arriving at Pearson should be able to get to Niagara Falls without driving. I was glad to see Niagara Falls service is actually now mentioned in Ontario Budget 2016. The media said there is supposedly an announcement coming May 2016(?) about upcoming future Niagara service. The Niagara-area coalition of mayors at www.niagarago.ca recently successfully negotiated a Welland Canal Guarantee for GO trains (4 trains per day will get to breeze the canal, boats have to wait) and allocated $40 millon of Niagara-area municipal funds towards getting the railroad ready for GO. When will it all finally happen? Not sure. Ontario appears really receptive. Perhaps as early as 2016-2017 for an "enhanced" version of the Niagara seasonal? I'd imagine by end of the decade for year-round GO train service to Niagara, the way things often delay. But we need to demand yearround Niagara happens ASAP like 2016-2017 for the first incremental service upgrade to Niagara, IMHO. If there is demand, the private sector should handle that. It is not government responsibility to provide a low volume/expensive route. GO trains today provide a terribly long Toronto to Niagara service that I would never take as most trains will take 2 hours! The private sector bus is definitely a better option being cheaper, faster and more frequent. your right let the private sector fill the void otherwise we will get a white elephant like the UP express. - Provide options to go to Bramlea Go Station (Line 48 to stop in Milton GO, or Line 27 to stop in Bramlea). - New Station in Trafalgar and BRT on Trafalgar up to Milton GO. I don't want Brampton GO train lines slowed down. Takes along enough to get to the station as is. Make it slower and we might as well drive. Sam reminds me of the difficult getting from Brampton to Milton, it's expensive and time consuming as a family. We use Zip car at the moment as it costs the same and takes less time and no schedule. I'd like a feasible alternative. Reasonable options please. An extension of the Stouffville GO Line to Uxbridge would be greatly appreciated. Even just building a yard like at Lincolnville in Uxbridge to store 2 or 3 trains overnight and having those serve the town would be great. The forced bus transfer at Lincolnville adds a lot of time onto the trip, the bus doesn't get to Uxbridge for another 30 minutes or so after the train pulls into Lincolnville. In the mean time, increased bus service would be great. Small things like running the last bus of the night all the way up would make commuting much more convenient. The last bus currently leaves at 11:30 from Union, which makes taking transit almost impossible if you are looking for a night out in Downtown. Running the buses more than every 2 hours would be nice too. I think as the 'missing link' discussion moves forward for freight, consideration should also be given to creating a connection that would allow a Milton (north Oakville as well) train that connects to Brampton, and perhaps, later on, York Region (Spadina Subway?). Not all travel is heading downtown, this connection would be extremely useful based on many existing travel patterns. There needs to be a strong, and logical sense of priority where the Relief line comes out on top. Its crucial in order to allow a future north-Yonge extension which can't be made until there is a relief line. Said line must go north to Eglinton, at the minimum, in order to achieve the goal of redirecting passengers away from the most congested part of the Yonge line. Though Sheppard would be preferable. Please consider the version of at least going up to Eglinton NOW (PHASE 1), or to Shop on Don Mills if nicer. I would think extending up to Sheppard is pending because it can cannibalize the ridership on Sheppard Subway which has always been criticized. The phase of extending to Sheppard should work with the RT outcome on Sheppard East corridor. Relief line is Job #1! Yonge is full from Finch! If riders can't get on further down the line it is at more than capacity. The relief line should go to Steeles and Don Mills to help to relieve the Yonge line. At that point, Yonge could at least be extended to Steeles without an overburdening increase in ridership. I respectfully disagree with the comments about additional stations slowing down the GO service. The intention is to electrify the lines, which will speed up the service. A couple of new stations will simply balance off some of the time savings and offer better connections and completing a network. Not everyone is destined for Union, and stopping at other locations within Toronto, especially downtown will benefit many many people and open up capacity at the very busy union station. Also, I've taken the GO train many times and I almost always stop at a light south of Bloor anyway. It would be nice if I could get off along the way especially in places like the Junction/St Clair, Liberty Village, and City Place. It would also be unfair to the citizens of Toronto to add 180+ train trips per day and not allow them to get on or off. The diesel expresses will continue to exist for Kitchener/Brampton service, because the electric trains aren't going that far. This little fact isn't even mentioned as part of the non-express SmartTrack proposals. Brampton is reportedly finally gaining all-day 2-way hourly service (with the addition of evening hourly trains Spring 2016) and there is no reason to expect these diesels trains to be discontinued when electric GO RER (SmartTrack enhanced) runs to Bramalea. They aren't electrifying quite all the way to Brampton (freight rail ownership issue) and the continuance of diesel expresses is unrelated to possible lack of electric expresses (in some of the SmartTrack options). I believe there is merit from a transportation and land use benefit perspective to extend the current Sheppard Subway from the current terminus at Don Mills to Agincourt/Kennedy GO. Further east from that point is currently more difficult to justify and may well be a good starting point for the proposed Sheppard East LRT. It will be important to provide some type of higher order transit connection between Sheppard Ave E. and Scarborough Centre. The Downtown Relief Subway (DRL) must be an ambitious plan that at minimum should reach Thorncliffe Park in its first phase of construction. This is lrt is making me question planning in Toronto. its like they just say lets build something here without even seeing where they are building. First this area deserves rapid transit and is most disconnected from the rest of Toronto. 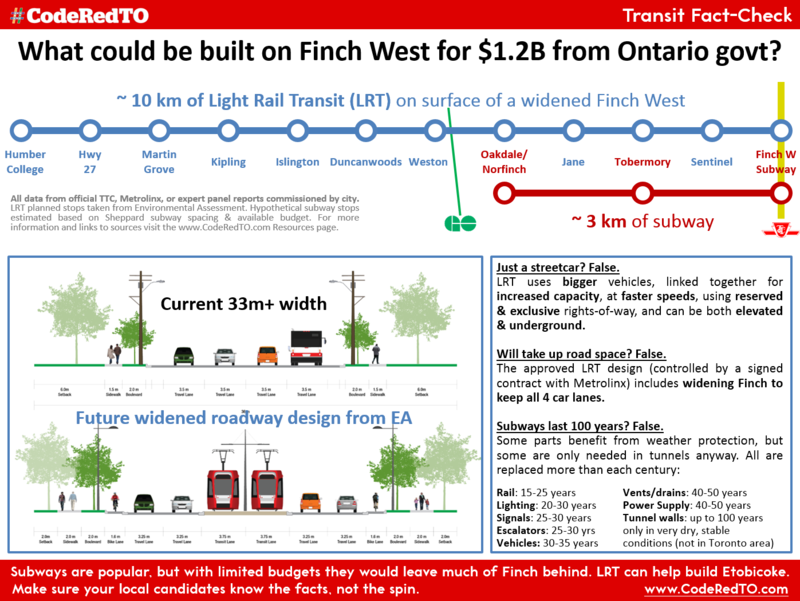 However an lrt on finch is a big joke. Finch is currently severely congested street (especially around Jane street). To make the lrt you guys are gonna convert two lanes (there is only 4 lanes on finch) into an lrt track. Okay but what about the drivers? and don't tell me you guys are expand the street because there is no room for expansion. Hence why the lrt is a joke. An don't say " well the drivers should be using the lrt" because people will still need cars to move around. ford was right, a subway for that area would be the best. The space between the sidewalks and the road is huge, there is a ton of space to add lanes at Jane. Finch is going to expanded along the whole line to get the same amount of lanes for drivers. All brand new smooth roads for Finch. The space between the side walks and roads is meant to be that big for pedestrian safety. Do you want the people to be walking right beside the road? Every busy road with pedestrian access and speed limits at 60km/h or above have that much space. Something like this, the parts that are next to the road are fine to walk on. The bridges on Leslie also have no gap from the road, it's also ok there too. Here we go... May I respectfully recommend you do some reading and educate yourself before you come and comment on transit in such an important forum. If there is gridlock beside the BRT it's not the BRTs fault. Are you going to blame traffic on the 401 on the St. Clair streetcar? What about all the traffic at Yonge & Sheppard, where both streets have subways, and at least 3 lanes for cars in every direction. It's been proven time and time again... If you Increase road capacity, with additional car lanes, you get more cars, and more traffic. Houston spent a few billion dollars to widen their highway and travel speeds got slower. That's a fact, look it up. Also, look up the Braess' paradox while you're at it. I lived in that area for 6 years of my life. I have seen the traffic and I know what would happen if an lrt were to be built. The user above me said there is plenty of space for more lanes of cars and showed me a link of of a google maps of a part that could be expanded. I gave him a reply that the space is needed for pedestrians. Also please note that the link he should me was one example that might work with expanded roads however if your were to go along finch you can see the majority can not be expanded. He then explained that it would be like the brt which still does not explain about the situations of the lanes (brt still requires lane removal and again like I said before this is no room for expansion). Now your saying adding lanes increases traffic and but does still not address the current problem of traffic. We will always need cars and they are never gonna go. Although alternate transit will reduce this, people will still use cars. You just said how traffic on Younge is bad but imagine how bad it would be if there was an lrt instead of the subway (which would mean 2 lanes of traffic). We have to think about the future as well because Toronto is a rapidly increasing each year with . I love how people say that all the large cities are still building lrt when it fact they already have extensive subway networks ( and still are also building subways eg Moscow). fyi shanghai did not have a major subway network in 2000 but in 16 years they built one because subways make sense to build because it moves people the fastest and does not impede traffic. Also i know how everyone likes to point at he Sheppard subway as an example of how subways are bad but give it time and you will see how useful it will be( even though it should have been longer than it was supposed to. Also please note that we do not need to run the subways on weekends and should do some cost analysis on good operation times (when the spadina subway was first built it would be open only on the weekdays). Now a subway on finch would be amazing for that area because it is the most disconnected from Toronto and really fast growing population. It would be also be connecting to Humber college which a major destination for many people in Toronto. Also take note that humber college is also increasing in enrollment and builds a new wing every 5 years. What do you mean educate yourself? This whole forums is about people expressing their opinions. How about this you should do some research before spitting out information you do not understand. There were many highway projects for Toronto in the past that were designed by engineers (like the spadina expressway). These were meant to alleviate gridlock in the future but were cancelled not because they would cause more gridlock but because of public opinion against highways. Now in the future I am guessing everyone is regretting their decision. The Braess' Paradox is a hypothesis so it is not definite and only explains some instances. Otherwise if it were to be proven it would be a theorem (remember grade school and the Pythagorean Theorem; will when a hypothesis gets proven it becomes a theorem). You’re telling me to educate myself? I have a post-graduate degree… you can barely string a comprehensive sentence together or differentiate between simple words like their and there…. Or correctly spell YONGE street. Also, I am well aware about the ridiculous expressway plan that would have destroyed our great city. The fact that you support this, proves how ignorant you are. I’m done responding to you, but I wish you the best of luck with your Finch Subway. Enjoy the traffic... that you cause. I did not tell you to educate yourself; you had said that to me. That fact that you are retorting by saying you have a post doc leads me to believe you are lying and Just proves how ignorant you are. HAHAHA, I spelled Yonge wrong. Great you deserve a cookie. As I stated before these forums are the opinions of everyone. So because I do not have a post doc I should not express my opinions? Your a very bad human being to name call someone you do not know instead of replying back with an argument or not at all. With limited funds we need to build to where the need is already there (DRL). The decision of subway vs LRT seems to have become ideological whereas it's a matter of ridership. The riders aren't there in the case of Finch. They won't be there till at least 2100 if ever. It's the same exact reason I say there shouldn't be a government run train from the airport to Niagara, nobody is going to use it and it would be a white elephant draining our tax dollars. We need to build what makes sense, no more white elephants. Yes I saw the links and read the data. I see how it shows the density of each neighborhood. Just like your data shows, The Sheppard subway will reach the density required for the subway. So we will reach the densities given time. I am just worried that if we build the lrt, and the density reaches the required amount for subways we will not build the subways that would be required. (because of how construction of Toronto projects take forever to be built). My idea was to not run the subways during off peak hours ( eg the weekends) That is how the subways like young and spadina were run till their densities reached the required amount for full subway service. And your right about the extension to Vaughan, that is a useless extension ( should have just been extended to york university) But I am in full support of the DRL. I'm glad that you took the time to read some of the reports others have linked to this conversation. One thing that people have missed with the whole LRT vs Subway debate is that LRT is very easy to expand. Take this example, when/if the Eglinton Line reaches capacity, it is easier to build another LRT on Lawrence or Wilson. 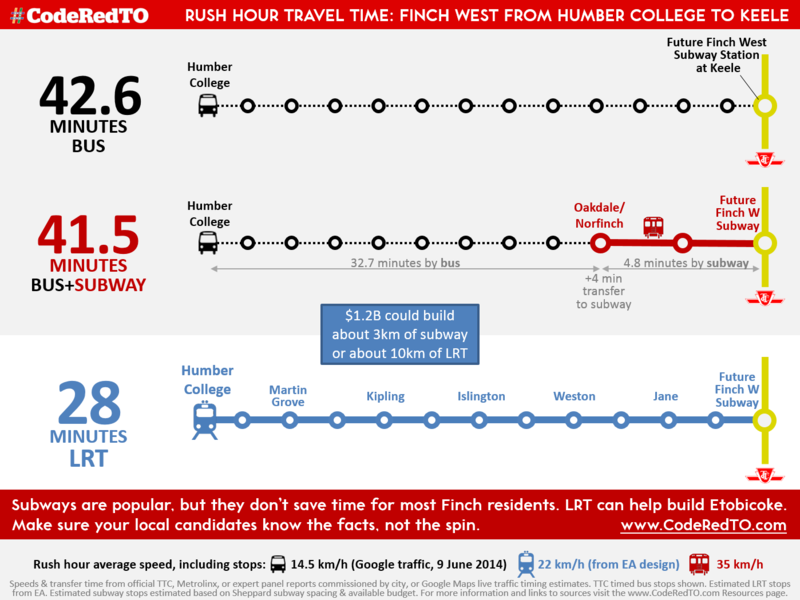 If the Finch LRT reaches capacity, Another one can be built on Wilson or Steeles. Sheppard is a strange situation. On one hand it's ridiculous to have a stump leading to nowhere, and on the other it's ridiculous to spend billions on a subway when the same job can be done with an LRT. I've seen a few amateur/fantasy proposals that actually make some sense. The DRL can potentially connect to the existing Sheppard line and form this shape ] ... connecting Yonge-Sheppard to City Hall via Sheppard/Don Mills Rd/Pape/Queen. We will all be long-gone by the time any of this comes to fruition, which is why we need to focus on improving RER and building the top priority projects right now. A lot of metrolinx plans show the drl from queen to pape. I think it should be extended to don mills in order to ease up flow on young properly. I use the young line every day and know how packed it is. (from finch to bloor during rush makes you feel like a can of tuna) And shouldn't the DRL be a top priority? We are talking about the sidewalks though! BRT would be built where there is demand so I would expect there to be bad traffic. I agree that we shouldn't take out lanes unnecessarily. A big part of the discussion around the Eglinton and Sheppard LRT lines were that lanes were going to be given over to LRT where this was not true. From what I understand, it is the same case for the Finch LRT, you spoke to Jane St which I refuted and then a different issue of sidewalks was brought up. Let's stick to the topic, where is it along Finch that you believe that lanes will be taken from automobiles and handed over to the LRT? Some sections of the Finch LRT that were supposed to see lane reductions will actually keep 3 lanes in each direction. The residents spoke up, and metrolinx listened, so under the bridge the bike lanes will be moved away from the street and 6-lanes of traffic will be kept. The LRT will now go below grade at HWY-27 to help car traffic and the 2 stops servicing Humber will become one below-grade stop. This new, single stop, will face south and can easily accommodate an extension to the airport or Woodbine. Lot of people complaining about the Milton line and go service to Milton but you guys never seen go service in Brampton. I live on the gore and highway 7 (that's a 2 min drive to Toronto) but it takes me 2 HOURS to get to union ( and no I cant drive to the nearest go station I don't have a ride so don't tell me to drive because I was just explain my distance from Toronto). I see people down voting the finch lrt comment but why down vote my comment about Brampton? Let me hear you rebuttals. Copenhagen has integrated biking with transit. There are bike carriages on all trains, people can bike to suburb stations, bring their bikes on trains, then bike to school/work dowtown returning home same way. CPH has an extensive biking network in all parts of city integrated with transit (extending into Malmo Sweden) even with a comparable cold/wet climate to Toronto. Biking requires much less infrastructure and allows user more flexability to alter their route to adapt to conditions or change plans. We need to think outside the box for costly infrastructure projects and see what has worked in other northern cities. I think that Metrolinx should work with CN to expedite the addition of an extra rail line thought and along the route from Bramalea Station to Georgetown. This would allow extra train traffic and scheduling opportunities. Begin the process to acquire the needed land and right of ways. Work with municipalities to ensure neighbouring land owners are not constructing buildings too close to the railway right of way. Barrie,Innisfil needs more trains and Innisfil needs a station. This is critical as there aren't many options for us up here. Houses going up everyday. We need the improvements.